SpongeBob SquarePants (TV Show) – From SpongePedia, the biggest SpongeBob-wiki in the world! From left to right: Clockwise from top left: Sandy Cheeks, SpongeBob SquarePants, Patrick Star, Eugene H. Krabs, Squidward Tentacles, and Sheldon J. Plankton. SpongeBob SquarePants is an Emmy-nominated American animated television series and media franchise. It is one of Nickelodeon's "Nicktoons" and is the most watched show on Nickelodeon of all time and SpongeBob is the most watch kid's TV show in history. In 2007, it was named by TIME as one of the greatest television shows of all time. Although its original network is Nickelodeon, SpongeBob is now broadcast across the world. It was created by former marine biologist and animator, Stephen Hillenburg, and is produced through his production company; United Plankton Pictures, Inc. SpongeBob has also appeared on sister network MTV2 for a short time in 2006. SpongeBob and his friends live in the underwater city of Bikini Bottom. Bikini Bottom is like a regular city with a downtown, suburbs, coastal areas, its own airport, bus system, and Fair Park. Stephen Hillenburg said once that Bikini Bottom was loosely based on Seattle, Washington. A good example of this statement is in the episode Pre-Hibernation Week. Sandy and SpongeBob were fighting on a tall structure called the Sea Needle, referring to the Space Needle, a tall structure in Seattle. Stephen has said that he wants to leave the location of Bikini Bottom to the imagination, claiming that the Baywatch scene was just a reference to his favorite show of all time. SpongeBob's house-pet is a snail named Gary, whose "meow" is similar to a cat. Although Gary only speaks in a few episodes, the characters have shown an ability to understand him. In addition to this, underwater worms bark exactly like dogs, and are kept on chains. Jellyfish are the equivalent of bees; buzzing, stinging with poison (although it appears as an electric shock), and producing delicious "jelly", mocking the name "Jellyfish", while still referring to a bee's honey. Fish act as the citizens of the community but, as a rule, are not important characters. SpongeBob SquarePants — A happy–go–lucky sponge who works at the Krusty Krab as the fry cook. Patrick Star — A dumb, yet friendly, starfish who enjoys everything that SpongeBob does and is his best friend. Squidward Tentacles — A grumpy octopus who enjoys playing the clarinet and is constantly annoyed by SpongeBob and Patrick. Mr. Krabs — The owner of the Krusty Krab. He is a cheapskate and loves money. Gary the Snail — SpongeBob's loyal pet snail. Sandy Cheeks — A scientist and friend of SpongeBob and Patrick. Plankton — An evil plankton who constantly tries to steal the Krabby Patty formula. Karen — Plankton's computer wife. Mrs. Puff — SpongeBob's boating school teacher who tries to get rid of SpongeBob. Pearl Krabs — The spoiled daughter of Mr. Krabs. Father SquarePants — SpongeBob's father. Mother SquarePants — SpongeBob's mother. Barnacle Boy — An old retired superhero. Mermaid Man — An old retired superhero. Flying Dutchman — A ghost who steals people's souls. Like Squidward, he is annoyed with SpongeBob and Patrick. Mama Krabs — Mr. Krabs's mother. King Neptune — The ruler of the sea. Squilliam Fancyson — A rich octopus who is also Squidward's rival. Bubble Bass — A picky eater who likes to make fun of burger cooks by ordering pickles on his burger, then hiding them under his tongue and claiming that he didn't get pickles on the burger. ManRay — Mermaid Man and Barnacle Boy's nemesis. Dirty Bubble — Mermaid Man and Barnacle Boy's other nemesis. Mama Tentacles — Squidward's mother. DoodleBob — SpongeBob's drawing gone wild. 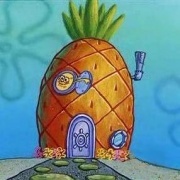 SpongeBob SquarePants is the only cartoon to consistently make the Top 10 list in the Nielsen ratings, and is the first "low budget" Nickelodeon cartoon, according to the network, to become extremely popular. Low-budget cartoons had not garnered as much esteem as higher-rated (and higher-budgeted) shows, such as Rugrats, although when SpongeBob aired in 1999, it had gained a significant enough number of viewers in the ratings to be considered popular, eventually becoming more popular than Rugrats had ever been. SpongeBob follows other Nickelodeon shows that have attracted "older" followers: The Ren and Stimpy Show, Rocko's Modern Life, the Kablam! skits, Action League Now! and The Angry Beavers. Other shows have followed in this trend as well: Invader Zim and The Fairly OddParents won a similar fan base when they aired in 2001, and the latter is now second only to SpongeBob in popularity, while the former was canceled despite gaining a cult following. The show debuted in 1999, and during that time, Pokémon was still the biggest craze. SpongeBob did not gain its popularity until around 2000, and it has remained popular since then. SpongeBob is one in a long line of cartoons that is designed to appeal to adults as well as children. This has a lot to do with the absurd way underwater life and situations are represented, and with the situations, references, and words used, which younger viewers might not understand. Certain innuendos also are intended to go over younger viewers' heads. For example, SpongeBob tried to show his grandma that he was a mature adult by wearing sideburns and a derby, and listening to 'free form jazz' or when Squidward tricked SpongeBob and Patrick into thinking he was a ghost, a coral reef sculpted like Toulouse-Lautrec's can-can girls stands in the background (leading to a pun by Squidward), are jokes most children would not understand. Numerous marine biology in-jokes are woven into the show. There are also often complex ironic scenarios that need close attention. While many newer cartoons revolve around pre-adolescents with strange lives and feature many pop-culture references (e.g. The Fairly OddParents), SpongeBob chooses to go for a formula that was used in highly successful older Nick cartoons such as Ren and Stimpy and Rocko's Modern Life, with non-human young adults in crazy, unrealistic situations, with minimal pop culture references. Part of the show's appeal has to do with the childlike nature of SpongeBob and his best friend, Patrick Star, both of whom are adults but display an innocence typical of human children. However, the characters are not immune from more adult avocations, including rock musicianship in a stadium performance, reminiscent of a hard rock concert, or Patrick turning to SpongeBob after they had nurtured a baby clam, holding his arms out saying "Lets have another". Unlike the Nickelodeon network, SpongeBob features well-known independent musicians who contribute to its soundtrack. Alternative rock bands such as Wilco, The Shins, The Flaming Lips and Ween (who have contributed two original songs to the show and their 1997 song "Ocean Man" to the movie soundtrack), as well as metal bands Pantera, Motörhead and Twisted Sister have made appearances on the show and movies soundtracks, and heavy metal group Metallica even released a T-shirt featuring cartoon versions of themselves playing live with the characters SpongeBob and Patrick. British rock singer David Bowie announced that he will be a special guest on the SpongeBob SquarePants episode Atlantis SquarePantis (aired on November 12, 2007). The show became so popular with teenagers and adults that the series was broadcast on MTV and featured on Spike TV. A quote by Patrick ("It's gonna rock!" from the episode Mid-Life Crustacean) has been used as a promotional tag-line for rock stations. Ren and Stimpy, among others, had followed a similar path. The SpongeBob SquarePants Movie, released on November 19, 2004, features a cameo appearance by actor David Hasselhoff, in a parody of his role from the Baywatch TV series. This page was last modified on 5 February 2012, at 02:02. This page has been accessed 108,017 times.